Recruit powerful citizens! Slay vile monsters! Expand your domain! Welcome to the Kingdom of Valeria. 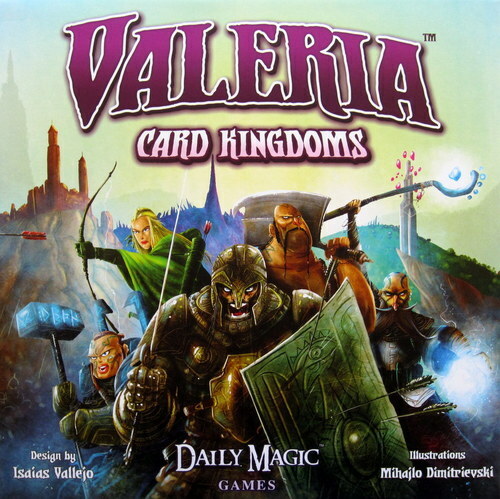 Valeria Card Kingdoms is the first in a series of games set in the imaginary Kingdom of Valeria. As usual, the game is a contest to see who can accumulate the most victory points. Along the way players will recruit citizens, slay monsters, build domains, and satisfy their particular Duke. All of these actions will yield points at game end. The central play area consists of a 4 x 5 grid of cards consisting of stacks of monsters, citizens, and domains. Starting with a small kingdom of one knight and one peasant, players will work to build their individual kingdoms. A turn consists of rolling two dice. The roll can activate up to 3 different types of citizens. Citizens are numbered 1 through 12. The 2 dice activate the citizen of each dice and the total of both die. So, a roll of 3 and 5 activates all citizens numbered 3, 5, and 8. The roll activates every player’s citizens of these numbers. Each citizen has 2 activation levels: a more powerful action when the player rolls their own numbers and a less powerful action when the roll is by an opponent. The result is that players receive something on almost every roll, so they can almost always do something good on their turn. This game does not bog down. Citizen actions reward players with resources, strength, gold, and /or magic. Resources are then used to recruit more citizens, slay monsters, and build domains. There are 5 of the 8 types of monsters available per game. There are 5 piles of monsters stacked in the top row of the central tableau of cards. In each stack the easier to slay monsters will be on top with bigger and stronger ones farther down in each stack. Additionally, each citizen has a role icon: worker, soldier, shadow, or holy. These roles are critical in building domains. To build a domain, players not only pay the cost in gold they must have the required number of roles on their citizens. In each game there will be 5 stacks of 3 domains available on the bottom row of the central tableau of cards. These domain cards will be dealt out randomly before the game from the deck of 24. There are 10 Duke cards in the game. Each player is dealt 2 Dukes before the game starts. Players will select 1 of their 2 Dukes to keep as their secret scoring goal. These goals will drive players to recruit certain citizens, build certain types of domains, and even hang on to certain resources. The game will end when all monsters have been slain, or all domains have been built, or the number of exhausted stacks of cards in the central tableau is equal to 2 times the number of players. Valeria Card Kingdoms features beautiful artwork on the cards, quick immersive game play, and plenty of replayability. There are enough citizens, monsters, and domains that they will not all be used in one game. Valeria is a kingdom worth exploring. Valeria Card Kingdoms is designed by Isais Vallejo who also designed Sunrise City.